Hi friends! I hope you are well. So... you like my title? It's pretty profound. ;) Honestly, I used to do this every single day. Did you know? I blogged everyday. And now, I'm lucky to blog twice a month. I'm having a hard time with this. I WANT to want to stamp but I most often don't. Does that make any sense at all? I wish I still had that drive and desire. Please send mojo! My friend Veronica helped me get my bum in gear today. I could not have done this without her. I am playing along in a couple challenges with this card. 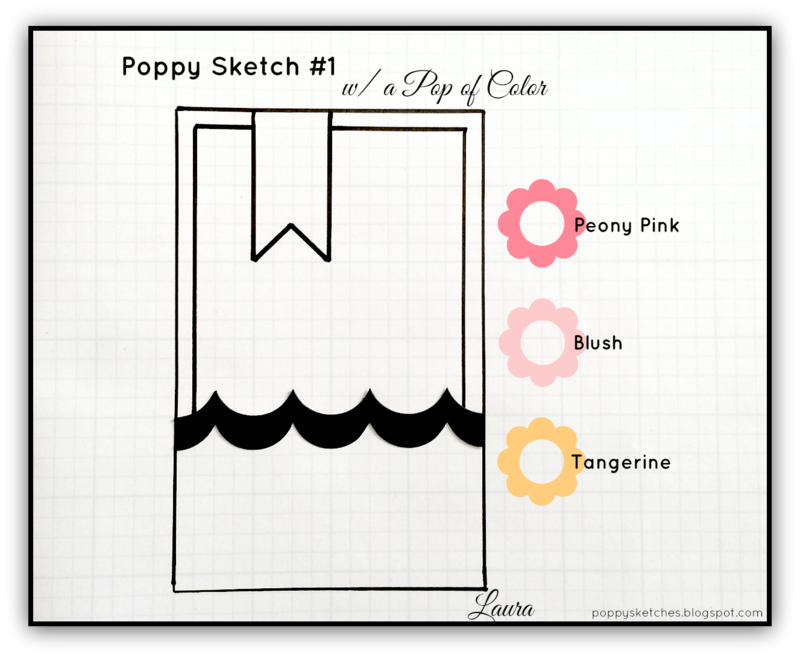 My friend Laura recently launched a challenge blog so I definitely wanted to play along with her Poppy Sketches. I didn't realize that there would be a color challenge too so I tried to work that in. Color challenges are the hardest for me. I also played along with the Paper Smooches Sparks Anything Goes Challenge for this week. The stamps are obviously Paper Smooches from the Spectrum set. I looooooooove unicorns! The paper is Chickaniddy as are the stickers and enamel hearts. I added washi tape and lace tape. Also, the unicorn is colored in with the clear Wink of Stella shimmer pen. Sending mojo your way! I'm like that at night lately. I have the best ideas during the day (when I can't be near my crafty space) and when I get home I'm too tired, but I'm sure when the time is right all the planets will align and you'll be crafting once again! I think this card is a great start! Its called you have children under the age of 5 in the house. It goes away- eventually..... Cute card! like the washi tape and star. Hello my friend, I am so glad you played along with Poppy Sketches! This card is adorable and you totally rocked the color part of the challenge! Cute Cute Cute...thanks for playing along Ashley! This is adorable, Ashley!!! Love the mix of patterned papers, the enamel hearts and that cute unicorn image! Thanks for playing along with us at Poppy Sketches!!! This is too cute, Ashley! 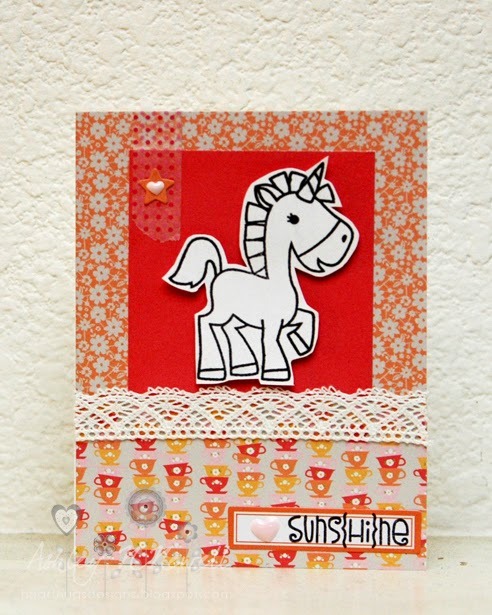 Love the mix of papers and the sweet, sparkly unicorn. Thanks for joining us at Poppy Sketches!